Most probably know the storyline - an astronaut gets left behind on Mars when his team loses track of him in a storm and is forced to lift off thinking that he is dead. I found the story to be more of a vehicle than anything. 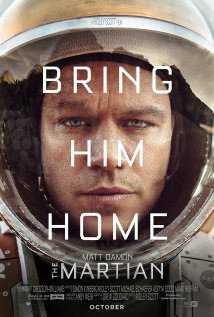 The real deal was the Astronaut Mark Watney (played by Matt Damon) and the way that he dealt with hardship. I loved how Watney showed discipline, humor and creativity as he overcame impossible odds. The other side of the story dealt with the different ways that the people at NASA and Watney's teammates dealt with the news of his death and then his unexpected survival. In the end their dedication to bring their friend home was a tad inspirational - albeit predictable. I also loved the technology and special effects of the move. I really liked the movie, recommend it to you and, on a scale of ten, give it ★★★★★★★★. I saw this movie yesterday and I loved it. I will most likely see it again with my husband Mark because it is definitely a big screen movie. I so agree Debby. A good one to catch at the theater.